Port of Los Angeles visitors can see cranes towering more than 200 feet high, some of the world’s largest container ships, California sea lions basking in the sun, fishermen returning with their catch of the day, and much more – a day in the life at America's Port®. A boat tour provides an excellent waterside view of these and other common activities that take place in the harbor. 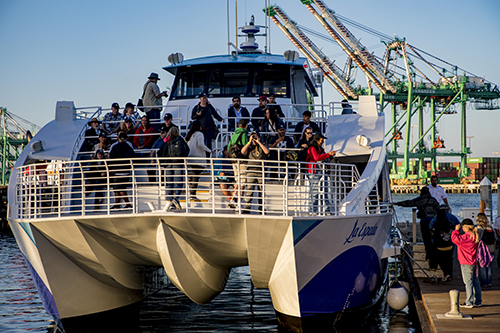 Contact Fiesta Harbor Cruises or Harbor Breeze Cruises for a boat tour around Los Angeles Harbor. Getting seasick is highly unlikely, but if you are extremely sensitive you may wish to take precautions. Tour boats don’t leave the breakwater and the water is generally very calm inside the Port, even on windy days. But, if something comes up, there are restrooms on board. Remember to bring a jacket, sunscreen, and your camera! Each year, on the third Saturday in May, from 10 a.m. to 3 p.m., the Port of Los Angeles sponsors free, 60-minute narrated boat tours of Los Angeles Harbor departing from two locations in San Pedro and Wilmington in celebration of World Trade Week. This event is free to the public and there’s no need to RSVP - tours are first come, first served. Visit lawaterfront.org or call (310) 732-3508 for more information. Specific departing locations will be announced in April.